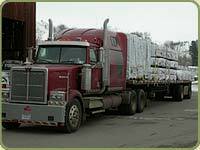 Bear Creek Lumber handles all freight arrangements and in most cases can deliver directly to your job site! An important note: It is the Buyer's Responsibility to unload the material as soon as it is delivered. Make sure you have the appropriate equipment to unload the lumber into your construction site. Larger orders are shipped as units that can only be handled by forklift or crane, so plan ahead! In some cases a crew of people could off-load your order, but trucking companies time allow for this vary. If you are interested in e-mailing in a quote request, or filling out our online form, please include an address to ship to (including zip code!! ), and a fax number that we can send the quote to. This information is crucial for us to have, in order for us to calculate the cost of shipping. We use UPS for the smallest orders. UPS will only accept pieces under 8 ft., but this is often convenient for customers looking for just a few pieces. We use common carriers for unit size loads (approximately 500 to 2,000 board feet). We ship these products to a central terminal where they are taken to destinations all over the United States. Larger Orders: Larger orders can save you money on shipping costs. 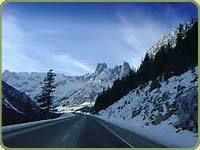 We hire an independent carrier who hauls with a 48 ft. flatbed truck to a particular region. We ship this way about once or twice a week. Some access restrictions may apply. Please inform your salesman whether the road to your job site can accommodate up to 70 feet in length for a trucks turnaround capability. Narrow, winding and steep roads may prevent delivery. If this is the case, please advise us of your alternative delivery/unloading arrangements. Your local lumber yard will often assist you with your unloading needs. Please advise us of your alternative delivery arrangements. Bear Creek Lumber has been shipping products nationwide for many years. Our shipping staff is well-versed in the art of packaging for the road. Every product will be wrapped against weather and road damage with appropriate side and bottom protection. It is covered in reusable abrine (water-repellant) lumber wrap which is fully banded with steel banding. Each unit is usually 2,000 lbs in weight. Read a testimonial about our packaging. If, for any reason, you find your product has been damaged en route, note the damage on the bill of lading before signing off on the delivery paperwork. File the complaint with the freight company for damage reimbursement. Next call your salesperson to discuss replacement. Download our Unpacking Lumber instruction sheet (PDF 640 Kb) to know what to expect when your order arrives.